Avi-Culture2 - The #1 Psittacine-specific Probiotic that actually works!! AVI-CULTURE-2™ is over 1,000 times more effective than most other avian probiotic products available to date! This new version now contains 10 viable strains totalling 5 Billion CFU's per gram! AVI-CULTURE-2™ is produced using proven, field-tested microorganisms that have been shown to implant on the villi of the intestinal tract in birds: Lactobacillus acidophilus, Lactobacillus casei, Lactobacillus plantarum, Lactobacillus rhamnosus, Bifidobacterium lactis, Bifidobacterium longum, Bifidobacterium bifidum, Lactobacillus salivarius, manufactured through a fermentation process and freeze-dried. This combined culture is blended with Fructooligosaccharides (FOS) a prebiotic, Magnesium stearate (Plant-based) as an anti-caking agent and Rice Maltodextrin as a carrier for a guaranteed potency of well over 2 Billion (02x109 CFU/g) at Best-if-used-by date shown on bottle label. Probiotics boost the immune system. Acidophillus also helps to restore the microbial balance within the digestive tract. The probiotic strains acidophilus and bifidum release anti-fungal enzymes and alkalinize the body, so pathogens, such as candida, can't flourish. AVI-CULTURE is a totally safe and beneficial product that utilizes species-specific "friendly" bacteria that arrives in the gut in sufficient quantities to allow birds to get back on track to a healthy, happy and long life! Sickly / ailing birds: When "good" or "friendly" bacteria are low, pathogenic (harmful) bacteria are able to multiply causing diarrhea, "pasted-up" vents, weight loss, "going light" and a variety of other problems. Healthy bacteria also help reduce allergies by balancing the immune system in a bird's gut. They are important after all antibiotic treatments to put good bacteria back into the digestive system. The benefits of probiotics are essential to good health and full recovery after treatments. The finest avian probiotic on the market with bacterial counts of over 100 million living organisms per gram for the avian intestine! It is over 100 times more effective than most other probiotic products available today! 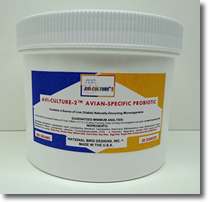 AVI-CULTURE® is produced using proven, field-tested microorganisms that have been hown to implant on the villi of the intestinal tract in birds: Lactobacillus acidophilus, produces lactic acid and the enzyme amylase during the growth phase of birds; actobacillus casei enjoys a wide temperature and pH range during growth and complements L. acidophilus producing lactic acid and amylase in birds; Bifido bacterium bifidium, a delicate microorganism found in mother's milk and human, animal and bird intestines; Enterococcus faecium for lactic acid production in pH ranges of birds similar to L. casei. Years of field lab and university tests have demonstrated the efficacy of the exclusive AVI-CULTURE® combination of the right organisms and the right process. Why is Lactobacillus Acidophilus so Important to your Bird's Health?